Watch Beowulf defend Hrothgar’s wall from the evil monster, Grendel. 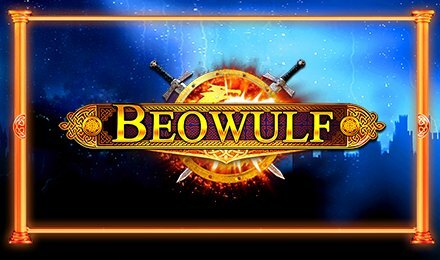 Themed on the oldest poem in Old English, you can now join Beowulf in Scandinavia and help him defend this city from harm and damage. Watch a number of events play out as you trigger the features and bonus rounds of the game, while you enjoy the setting of the slot grid and its background. On the set of reels, you will find symbols like; Beowulf, Hrothgar, Horns, War Ships, Emerald Rings, Wealtheow, Spades, Diamonds, Clubs, Hearts, Shields, Swords and Magic Mirrors. Enjoy several top features on the 5 reels and 40 paylines. Adjust your bets in the Bet Menu and use the + or – buttons to adjust your stakes. After having selected your preferred stakes, click on the Spin button to start your gameplay. Use the Autoplay option to your advantage, which allows you to select 10, 20, 30, 50, 70, 100, 500 and 1,000 spins to put to play. Bet Levels: Set your bets levels from 1 to 10. Amount of Paylines Selection: All 40 pay-lines are fixed. Coin Values: Set your bets from the lowest amount of £0.01 to the maximum amount of £0.50. The Magic Mirror is the wild of the game. This substitutes for all other symbols except for the scatter symbol. The scatter symbol is the Shield and Swords symbol. This symbol triggers the Free Spins Feature. Landing three, four or five scatter symbols on the reels activate the Free Spins Round. This will award you 10, 15 or 20 free spins respectively. By landing more scatter symbols during the play of the feature, you can trigger more free spins. When four stacked Beowulf symbols land on the first reel, this feature is activated. Regular reels then fade and are replaced by a new reel set which contain empty spaces and Beowulf symbols. The feature starts with 3 re-spins. All Beowulf symbols that hit the reels become sticky and stay on the reels till the end of the feature. Beowulf pays from right to left and left to right of the slot grid.